Neil Macdonald is the senior Washington correspondent for CBC News, which he joined in 1988 following 12 years in newspapers. Before taking up this post in 2003, Macdonald reported from the Middle East for five years. Many years ago, I was a young reporter working on what appeared to be a bombshell tip. I placed a call to a man named Archie Barr. I’d been told that Robert Coates, Brian Mulroney’s new defence minister, had compromised himself, and a briefcase containing national secrets, somewhere in Europe. Apparently hookers were involved. We had further been told that some top-secret government agency was investigating. At the time, Barr ran a top-secret government agency: the Canadian Security Intelligence Service. He was its deputy director. He assured me CSIS was not investigating any such story. Though he said some other agency might be and, if it were, it might not have seen fit to tell CSIS. So I kept digging. Long story short, we found out that Coates and two assistants had been in a bar featuring strippers and hookers outside the Canadian military base in Lahr, Germany. There was no briefcase of secrets involved, but Coates’s officials had misled Lahr’s base commander. They had used his official car, were tailed by military police and had spread expense-account money around the bar. Coates resigned and Privy Council Office security officials, we discovered, had been looking into the case. Archie Barr died quietly last Sunday in Kingston, Ont., after decades of kidney disease. He was in his late-70s. He joined the RCMP at 18 and would eventually be sent off by the force to the Royal College of Defence Studies in London, U.K. I cannot say I knew him well. I’m not sure anyone did. He was a cipher even to other spies, and Scots-Canadian farm boys from Winnipeg don’t open easily to others, especially reporters. But I grew to consider him something of a friend. I also realized he was one of the smartest people I had ever met. We’ve corresponded for years. When I first met him, in 1982, he was still a cop — a chief superintendent in the RCMP security service, where he’d spent a career chasing around Cold War spies and trying to persuade East Bloc diplomats and citizens to betray their countries. I had met lots of cops by that time, but none like him. He didn’t believe in the us-versus-them code that guides most police. He believed that law enforcement agencies are there to protect the civil rights of the population, not violate them. He believed that if someone is investigated and found to be without fault, the fact that person was investigated at all should remain a deeply guarded secret. He also believed, as did at least two royal commissions that examined the sometimes illegal antics of the RCMP, that police, with their black-and-white, arrest-the-bad-guy approach, don’t make good intelligence agents. And he talked freely about “our sins.” He felt the Mounties had some atoning to do. That view didn’t make him particularly popular in certain circles of the RCMP. Nonetheless, he went on to become the guiding intellect behind the establishment of CSIS, Canada’s first civilian intelligence agency. “It would not have happened without Archie,” an old colleague who followed him into CSIS told me this week. “It was uncommon within the RCMP to run into someone with his intelligence and determination.” CSIS was a quid pro quo. The new agency was given unheard-of powers, subject to judicial approval. In return, Archie Barr ensured CSIS submitted to an unheard-of level of oversight — both its inspector general and the Security Intelligence Review Committee have carte blanche to go through its files. “He knew the faith and credit of the Canadian public was the agency’s bread and butter,” said his former co-spy. “He is probably most responsible for what we have now, which is a pretty good agency, with a reputation around the world.” Barr was a counter-intelligence guy from another era. He was a close friend of Sir William Stephenson, the famed Canadian “Man called Intrepid” whose spying on Nazi Germany helped change the course of the Second World War. Barr even introduced me once to the great spymaster. He was also a trusted contemporary of James Jesus Angleton, the fanatically anti-Communist CIA executive who tore that agency apart during the 1960s and 1970s, looking for Soviet moles. Angleton at one point named former Canadian prime ministers Pierre Trudeau and Lester B. Pearson as possible Communist agents, and it is probably no coincidence that Barr and a few other young Mounties began Operation Featherbed, a mole-chasing exercise that ended up investigating hundreds, if not thousands of Canadians, including journalists and, reportedly, Trudeau himself. “We did probably cast the net too wide,” says Archie’s ex-colleague today. “But we knew we were penetrated, and operations were going sour, and we did what we had to do.” Featherbed was sealed decades ago, and remains sealed today. Being part of operations such as Featherbed almost certainly had something to do with Barr’s conviction later in life that intelligence agencies need leashes. Justice John Major delivered a scathing report in June 2010 on the RCMP and CSIS and the way they handled the 1985 Air India bombing. He called it a ‘cascading series of errors.’ (Canadian Press). It may have even contributed to his belief that intelligence agents and reporters were not adversaries, but, in their own ways, support systems for democracy, something he tried routinely to convince his colleagues of. We both attempt to uncover bad behaviour, he once told me, we just report it differently. That’s not to say Barr was everyone’s source. But he would pick up his phone, and he would answer serious questions, and reporters who bothered would learn that there are real threats to Canada’s security and that dealing with them is a serious business. He provided some insights I will never forget. People never see themselves as they truly are, he used to say. Even the smartest ones. If you understand that, and you can understand how a person does see himself, you can exercise a frightening power over that individual. That is how a good spy handles his agents, and that is how cult leaders exercise their hold on people, and that is how good managers manage. It is also why reporters can be so easily manipulated, and realizing that is essential if you want to do the job properly. From time to time, I felt I could recognize Barr’s theories and musings in accounts by certain other journalists. Often, it would be those accounts of politicians who loved having secret organizations at their disposal, and who wanted results, but of course also wanted deniability in the event something went wrong. And things did go wrong. Archie’s personal demon was Babbar Khalsa, the Sikh extremist group almost certainly responsible for the Air India bombings in 1985. CSIS was a young agency, still running on RCMP rules, and it failed, probably more because of human error and imperfection and bad judgment than laziness or malfeasance. From where I sit, Archie Barr was a Canadian patriot. More reporters should meet spies like him. He may have sinned. We all have. But he was among the very few responsible for making the shadowy world more accountable to the public it serves. A footnote: I was sued by Bob Coates for the story about his adventures in Germany, and in the course of testimony, a rather foolish ex-boss at the newspaper for which I worked blurted out that Neil Macdonald had a source in CSIS. Coates of course wanted the name and I tried the journalistic stonewall, but the reality soon became clear. I had a choice: Name Archie Barr or lose the lawsuit. I finally called him, and he told me that if it became public that he had spoken to me, he’d be finished at CSIS. That said, if the newspaper promised to appeal, he would come forward himself if the case was lost in the high court. Eventually, he said, we all have to take responsibility for what we do. As it turned out, Coates dropped the suit, so it wasn’t necessary. But I am certain Archie Barr would have stepped forward. Like I said, he was a pro. From my earliest memories, my mom’s youngest brother, Uncle Archie was somewhat of a hero in our family, and to me in particular. We didn’t get to see him often but each visit was a family event. 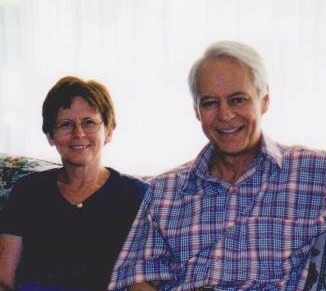 I remember his wedding day and a few brief visits to Denfield but most of all I treasure the few times as a young girl that I was able to stay with he and Aunt Judy and their growing family. Uncle Arch would keep me in stitches with the antics of “Mervin Wicket” a fictitious character who was always up to no good. There was never a dull moment in their home, especially the times that I stayed with Judy and the kids while Arch was away on some assignment or other. While in my nursing training, I would often spend my holidays in Ottawa and looked to Archie and Judy for advice and an understanding of my family history and how the Barr family worked. I listened to Archie’s stories of the exotic places that he had visited and that only served to fuel my desire to explore the world. I will always treasure, even the very difficult nights I spent with Arch at Judy’s bedside in London, as he supported and encouraged her and spoke so dearly of his love for Judy and the family they had together. I have watched with such respect over the years as Arch and Beverley taught us all how deal with loss and physical struggles with courage and dignity. He took every aspect of his life very seriously and developed a deep and abiding faith in God and love for all that He created. My thoughts and prayers are with Beverley, Charlie, Peter, Linda and Heather and their families as they say their final good-byes and honour the life that he lived. ARCHIE McARTHUR BARR (1935-2012) From his humble beginnings as a Winnipeg farm boy, Archie joined the RCMP in 1953. 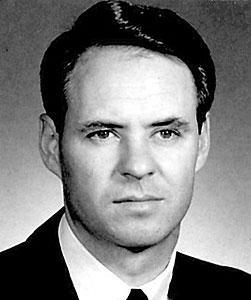 Through his strong convictions and keen intellect, he quickly developed a reputation within the intelligence community, culminating with him attending the prestigious Royal College of Defence Studies in London, England in 1979-1980. Archie rose to the rank of Chief Superintendent of the RCMP and went on to become one of the founding Directors of the Canadian Security Intelligence Service (CSIS). After working as a high-level consultant for the Federal Government, he retired to his small private investigating service specializing in genealogical research. He will be profoundly missed by his family and extensive network of friends for his perception and intelligence, his fierce loyalty, and his mischievous sense of humor. “Your woods are lovely, dark, and deep, But I have promises to keep, And miles to go before I sleep” Sleep well, Old Horse. Pam and I are late bloomers when it comes to bird watching. Kids and jobs were pretty much fulltime occupations when we were younger. Vacations during those years had more to do with Disneyesque theme parks than tracking the movements of ruby-throated warblers. Up until this year vacations in Asia have been about seeing the sights of this fascinating part of the world: the Great Wall of China, the fabulous ruins of Angkor Wat, and so on. 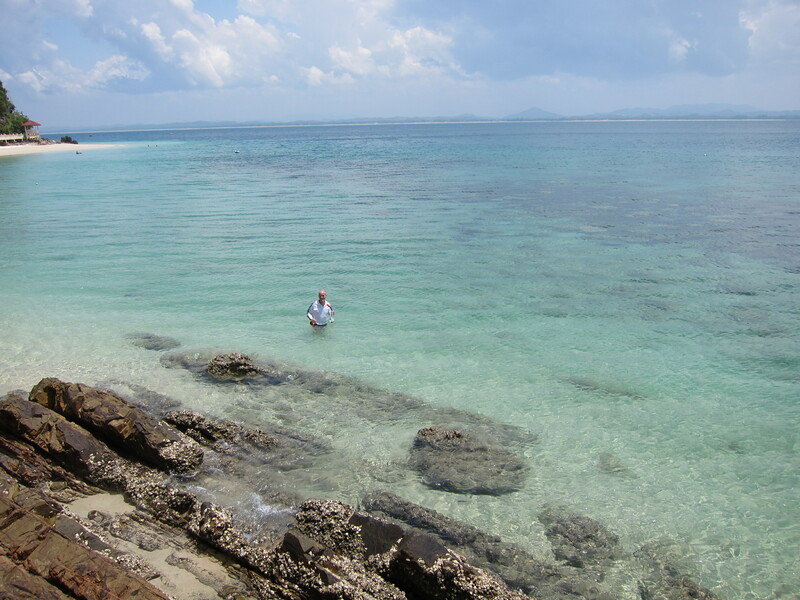 Regular readers of this site will have noticed our absence of travels within Malaysia itself. All that changed when we bought a car. Now it makes more sense to travel by road than air, and now we finally have access to some of the more remote parts of this beautiful country. The last couple of days we have been at Lake Kenyir, and this morning we went out with Misram, a budding bird watching guide himself, to see what we could find in the trees and skies above the park. 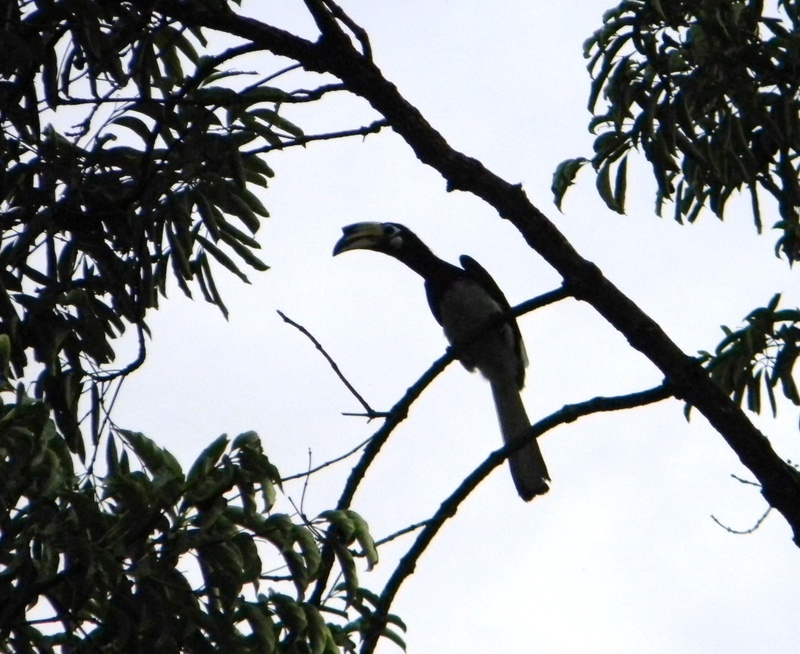 I was greatly encouraged to see a couple of hornbills flying through a gap in the trees almost as soon as we walked out the door of our little cabin. From the shape of their head and colouration we think they were Crested Hornbills. The pair was later followed by another pair, and then what appeared to be an unattached bird, although perhaps its mate was simply flying lower in the tree line. We met up with our guide who kindly provided us with a second and much better pair of binoculars – 10 by 42s – to supplement our own meager 8 by 21s, and we set off through the park-like surroundings of our resort. 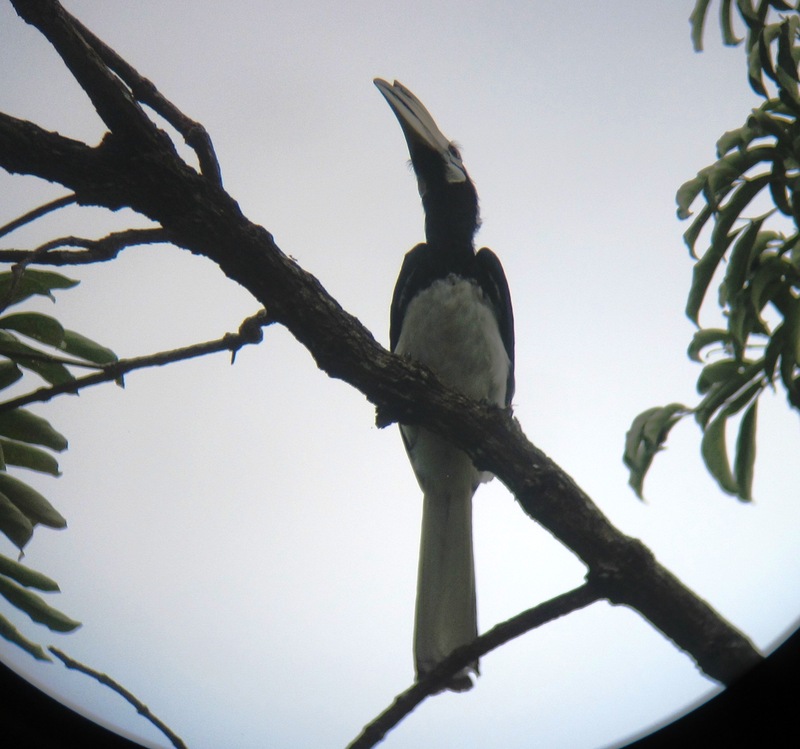 Before we had gone twenty paces we saw a mated pair of Oriental Pied Hornbills in plain view. We were even able to get in a couple of decent pictures before they took off. 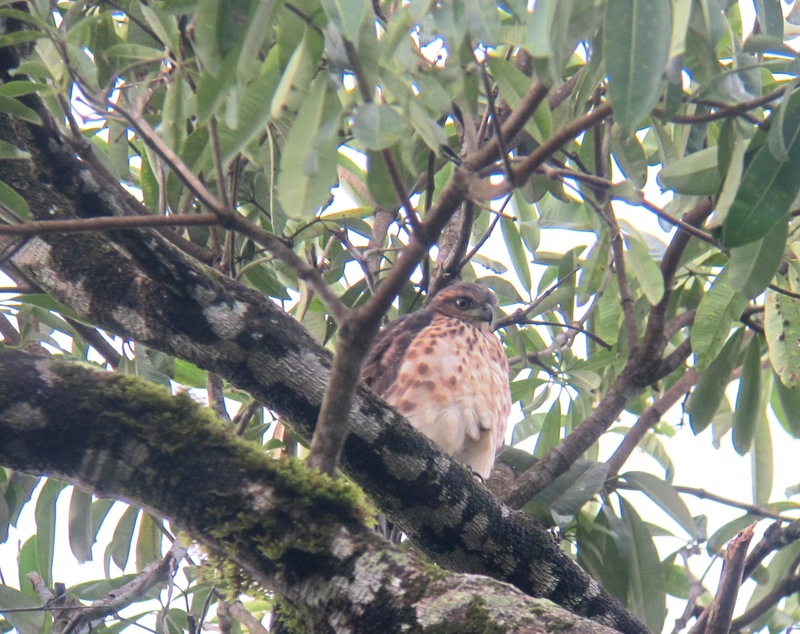 Our next stop was at a tall stately tree that contained an eagle’s nest and sitting on a branch beside it a young Crested Serpent Eagle nestling, surveying its domain with lordly splendor. Other smaller birds were also in view: swallows and swifts in great profusion, little bulbuls with their fluffy green feathers and a couple of hill mynahs with a very artful song. The most delightful song, however, came from the magpie robin, a black and white striped cousin of our North American variety with a real repertoire of sounds. All this before we even got to the car! We drove to our first stop by the lake in the hopes of seeing our main prize of the day, the elusive and defiantly gaudy Rhinoceros Hornbill. 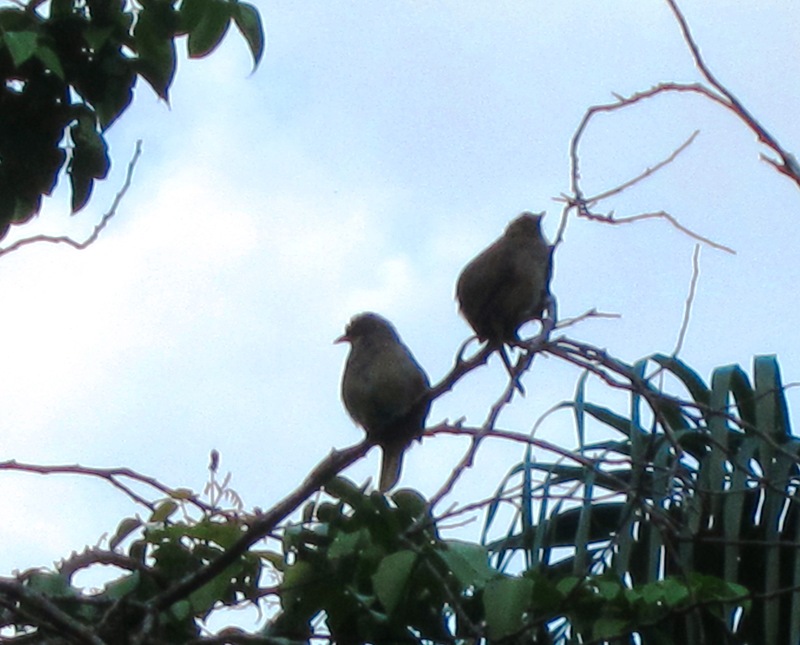 We saw some more bulbuls and a very dainty little flycatcher. We also saw a brilliantly yellow oriole with black stripes, but no hornbills. 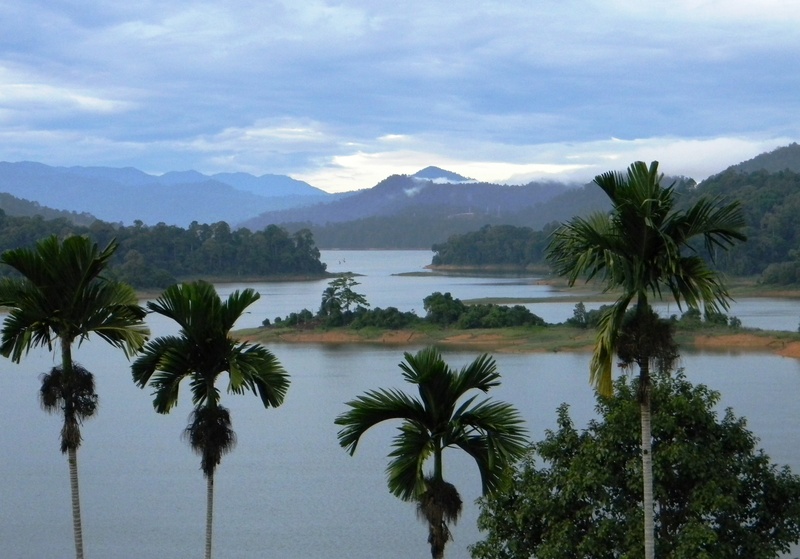 We drove on to another disused access road for the dam that forms this lake, and were about to return disappointed when we saw in the distance a couple of Wrinkled Hornbills; not our main prize, but some consolation for our troubles. 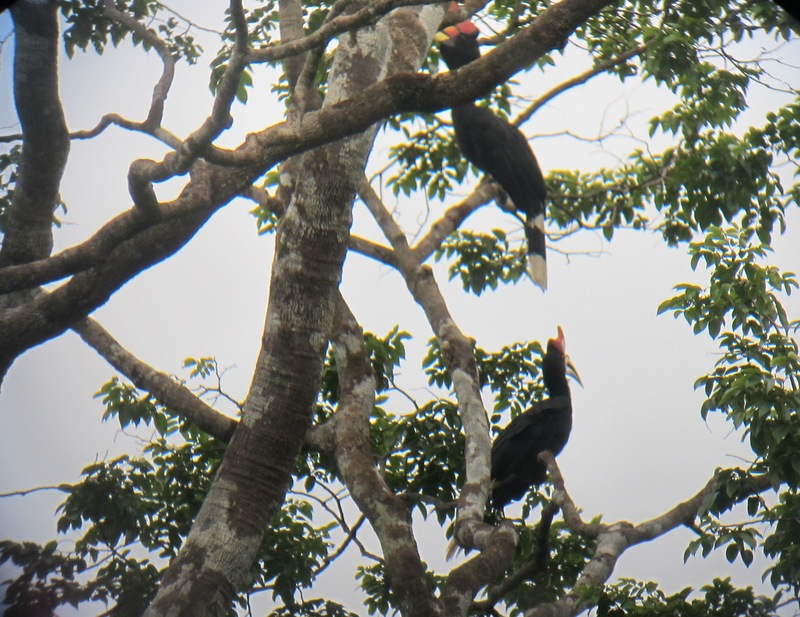 We got back in the car and were driving back to the resort with Misram called out, and there in a tree by the road were two Rhinoceros Hornbills making their way up the tree in their awkward and ungainly way, pausing to peer upside down as they went and in quite plain view. It was an exciting sight to finally see these fabulous birds after five years. 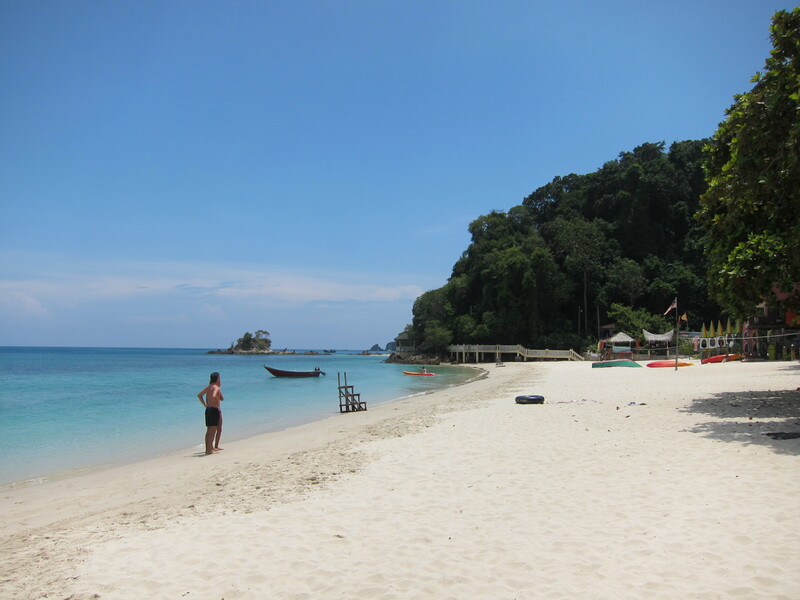 We returned to the resort and to the cool refreshment of the pool, which we had entirely to ourselves, marveling that such a fabulous resort with such an abundance of wildlife remains so unknown to Malaysians generally and to the world at large. 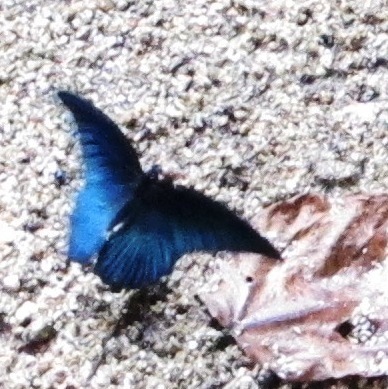 This is an amazing place to come to see some pretty fantastic species, and should be much more widely known than it is. Our thanks to an excellent guide in Mizram we had an awesome bird watching experience. Nestled away in the northern state of Terangganu lies Malaysia’s largest, and completely man made lake, comprising 620,000 hectares of water surrounded by virgin tropical forest. For the life of us we cannot understand why this gorgeous setting with its lovely resorts is not more well known or visited. It merits scarcely a half paragraph in The Rough Guide, most of that confined to the completely ludicrous suggestion that you rent a houseboat for your stay. You could do that, or you could stay at a lovely little chalet with your own airconditioned room, king size bed, decent TV, enormous bathroom awash with hot water and balcony overlooking the lake. Or skuzzy houseboat. Take your pick. Our package included an endless buffet breakfast that we could not possible eat to the end of, a buffet supper, Mongolian style, and a two hour boat trip around the lake. Jalil, our guide, lives in the area and works at the park. His English was pretty good and he was able to guide us around the herb garden, our first stop, explaining the use of the various plants and trees that grow there. Another guide at the stop explained the properties of the teas he brewed for his guests. We drank one that was made from the bark of a local tree. It was bitter, but no overly so and in fact was pleasantly acerbic. Its reputed effect was to make one’s blood bitter tasting, and therefore less inviting to mosquitoes. We didn’t get bit that day, so perhaps it worked. 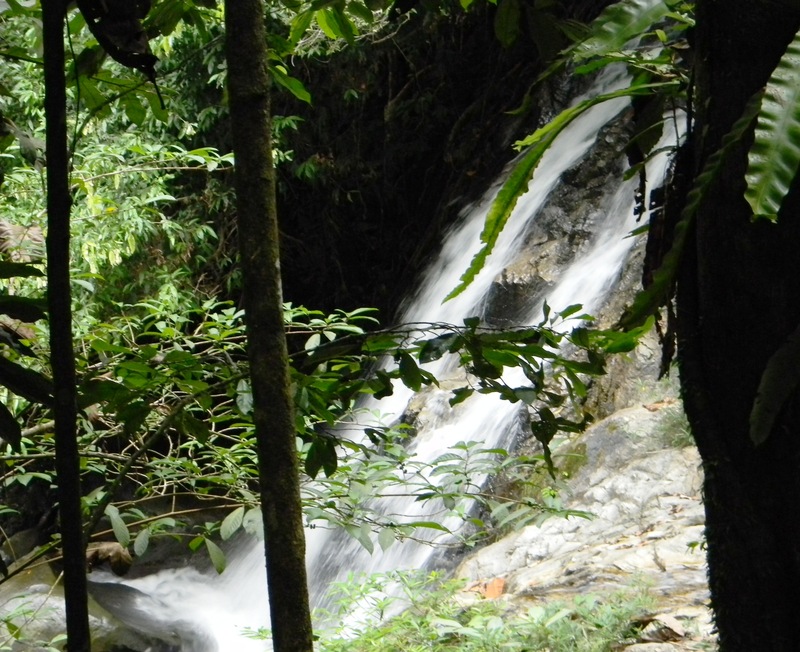 Our next stop was at a waterfall, depleted now as it was the dry season, but still inviting enough for some of our fellow travelers to enjoy a quick splash. I was encouraged to see Jalil pick up the few bits of garbage that others had left behind. Clearly his job had taught him some love and respect for nature, and he wanted to preserve its beauty. And the lake is beautiful. You can say what you like about the impropriety of making such lakes. It provides clean and cheap hydroelectric power to the state and a habitat for many birds and fish that have made this area their home. It displaced no one, and has disrupted no natural order. It provides a decent living for many who are employed at resorts around the lake, and an ideal spot for the traveler weary of flashy and overcrowded resorts. There is a bus that leaves from the Putra World Trade Centre in KL at 9 am and 9 pm. The evening bus goes overnight and gets you here for an early morning check in. The one in the morning gets you here at 4 pm in time for supper and the fabulous evening sunset over the lake. If you were looking for some place to go in Malaysia away from the crowds, you could do no better than this idyllic little retreat. This week marks the end of Ramadan, the biggest holiday of the year in Malaysia, when everyone heads to their home town for a week of festivities. 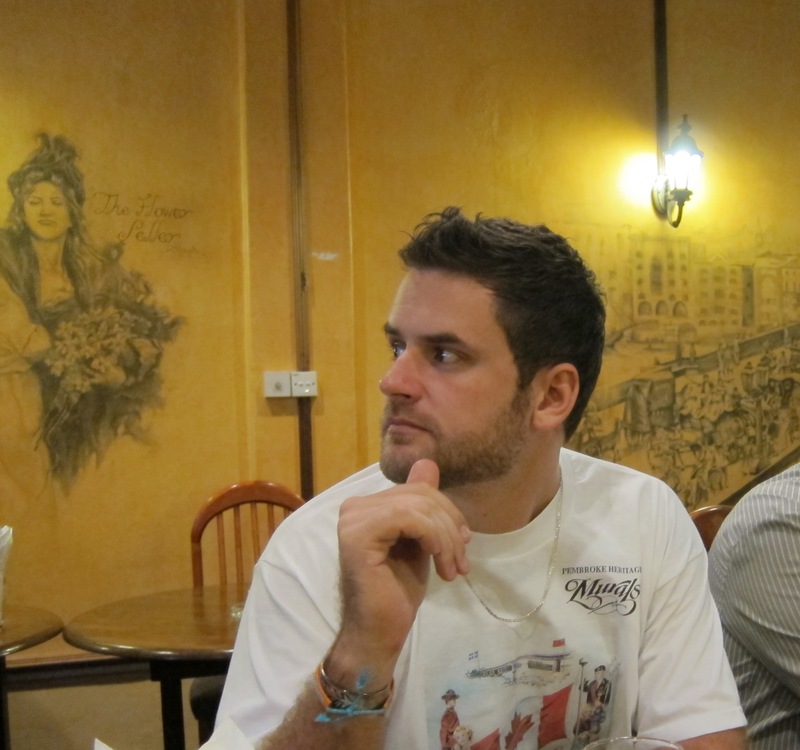 We decided to take this week to do something that we were unable to do until recently: explore more of Malaysia by car. Accordingly we headed off the Kuala Terengganau, the most Muslim state in the country that boasts some of the nicest beaches on the north east coast of the mainland. Forgive us our Western cynicism, but truthfully we were not expecting too much, having seen what some locally run tourist sites look like near KL. But after just the first day, we can’t believe what incredibly beautiful sights have been just four hours away from us all this time. The drive across the central highlands of this country has always impressed us with its beauty, but the water on the East Coast looked just beautiful, and the further north we got, the more lovely it seemed. We landed in Kuala Terangganu, the capital of the state, and booked in to a very nice hotel with Wifi in the room, decent cable TV (Johnny English, yay!) and some comfy beds. 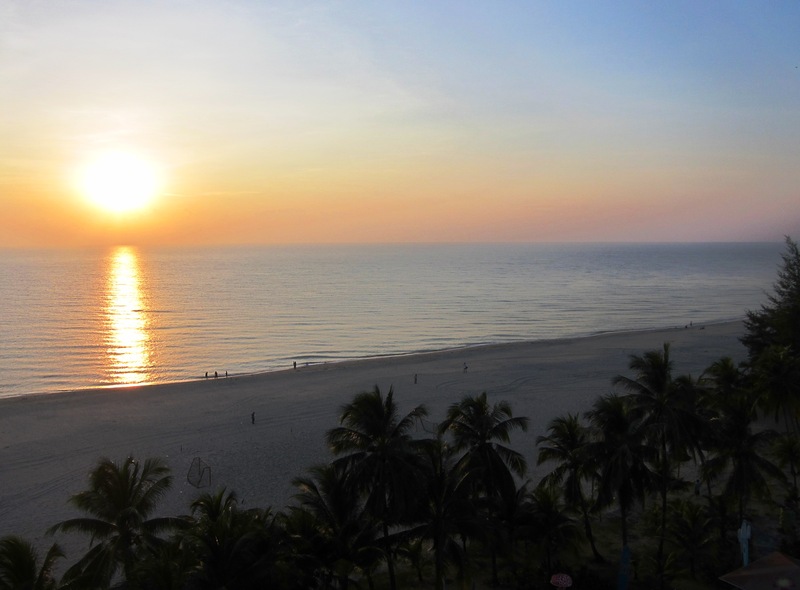 We got an early start and had the joy of watching from our balcony as the the sun rose over the South China Sea. A short drive south again brought us to Marang, hard on the coast, and graced by an enormous mosque that would have done KL proud. 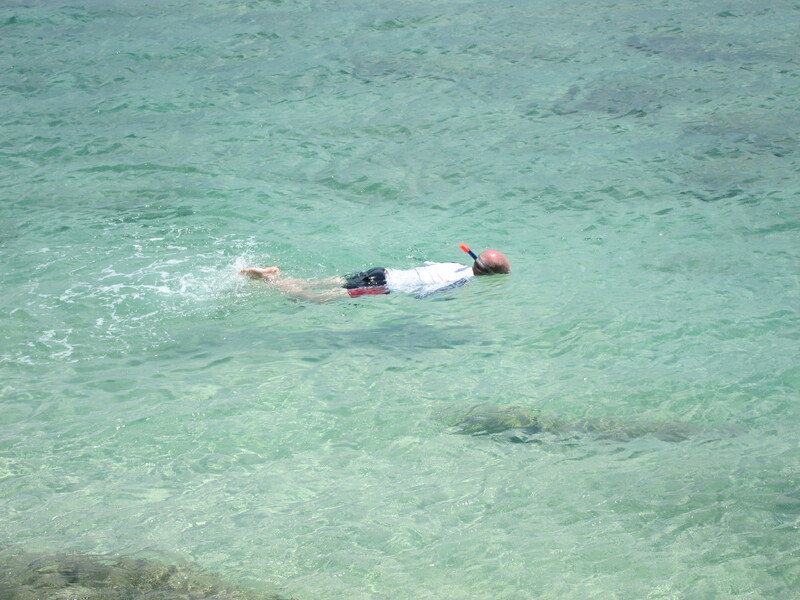 Just ten minutes by fast boat from the Marang Jetty lay Kepas Island, a little known and relatively undeveloped tropical island surrounded by crystal clear warm water and awesome banks of coral. We headed to the nearest beach hut cafe for a coffee and a watermelon juice to talk through our strategy. We spent hours snorkeling over an underwater water world, watching literally hundreds of different species of fish in the most amazing colours and sizes. For a brief moment I almost panicked, thinking I must have drifted far from shore in order the encounter this beauty but I lifted my head up and realized I was about twenty feet from the sand. The charcoal black sea urchins with their diamond ‘eyes’ were startling and dangerously abundant. The little clown fish in their soft coral fascinating and elusive, the enormous purple mouthed clams that would ominously close as you approached were mysterious and strangely beautiful. We headed home, tired and having had a little too much sun, marvelling that the Creator of such beauty could love and care for such as us. And tremendously grateful for the privilege once again of seeing His awesome beauty on display in His underwater kingdom. As wonderful as it is to have two months in Canada, not only to visit with family and friends but also to make some key ministry connection, this does take its toll on work here. I have not been in Cambodia since April and there is much to do to get caught up. I had nine days here on this visit and they have filled up pretty quickly. My first task was to meet with TWR Cambodia leaders to finalize a proposal for funding for the Health Project that is growing at a phenomenal rate. It was wonderful to be back in the office and to hear reports of the work of this amazing team. We submitted the proposal to the potential funders on Wednesday and would appreciate your prayers as they consider the needs of the team here. In today’s economy, it is a relatively small amount of money but has a huge potential in the hands of committed national staff. On Monday, I spent six hours hurtling, at high speeds through heavy traffic on patchy roads by bus to Siem Reap. I was escorted around town by Channy and Nyny Ann, the new trainers from RHAC who will be working with TWR in our CHE project. I am not sure that I will ever be comfortable on a motorbike but was grateful for the ride and pleasantly surprised at how well a motorcycle can accommodate three people. If you want to take a Cambodian out for dinner, always let them choose the restaurant. We had quite a lovely meal and the total for the three of us came to $5.00. Tuesday morning I spent visiting with a dear friend, Chantheng, a RHAC staff and a new brother in Christ whom we have come to love. 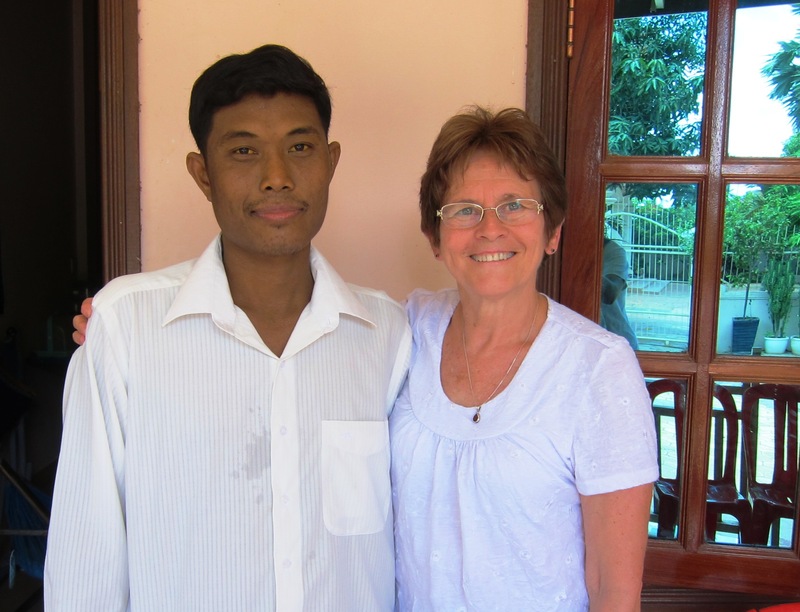 He is a young husband and dad with a real passion to transform the lives of his fellow Cambodians but is now facing a very serious illness. Pray for healing, peace and strength for both he and his family as they learn what it means to walk with God on this difficult journey. Interestingly enough, I am actually here this week because TWR is doing a week of CHE training with a Presbyterian church group but now it is completely facilitated by our Khmer speaking staff, and expats are here only for encouragement and networking opportunities. Even if I don’t understand a word, I do know the content of the lessons and always enjoy the excitement on the faces of the participants as they make new discoveries about themselves and their communities. Networking is what I do and this week was no exception. I met with three other individuals from organizations who have a history with CHE to see how they are currently utilizing the strategy and met with Canadian missionaries who will be hosting a team next summer from our home church in Canada. 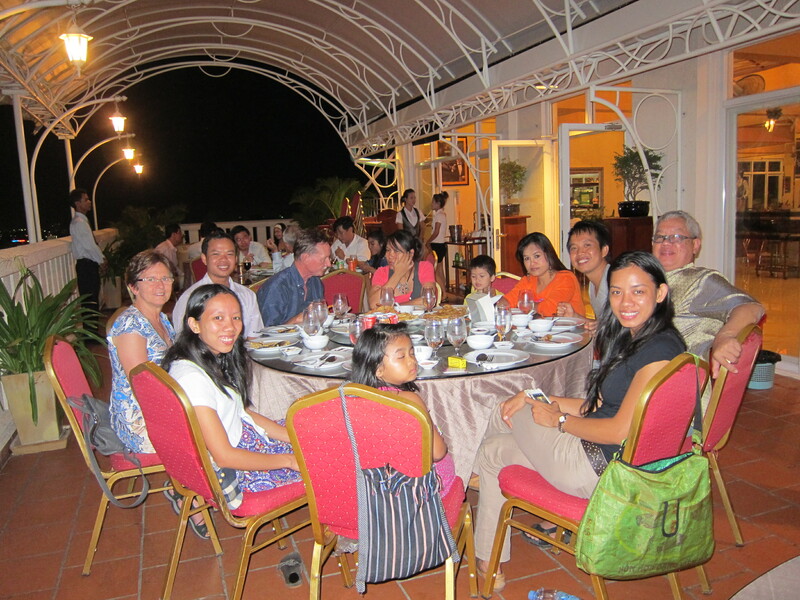 Add to that a wonderful evening dinner with the Cambodia Leadership Team at a new restaurant with a fabulous view of the city and coffee with our friends Phearak, Socheata and their little boy Kenta and it all adds up to a full and successful visit. It never ceases to amaze me how God has lead us each step of the way in this ministry over the past five years and what a joy it is have the privilege of being a small part of what He is doing through some amazing young Cambodian brothers and sisters. Living overseas in an expat community has its own peculiar challenges. It takes a special kind of person to live and work overseas in the first place. Many are pretty strong willed and adventuresome, and committed more to their own personal agendas rather than the corporate goals espoused by whomever they are working for. It makes us rather a fluid bunch, shifting easily from country to country, and back again to Canada whenever the lease expires on their incentive to be here. Over the last few weeks we have lost eight of our friends from this community. Pete and Joan, whom we met up with in Calgary on our recent visit there, were the first to go, eager to get some interviews in at the end of the school year in order to secure teaching positions for the coming year. We had grown quite close to them in the short year that they were here, and encouraged by their love for the outdoors had been encouraged to stretch ourselves into hiking some of the many trails that lace this country and even trying to scale the walls of a local climbing gym. The next to go was my dear friend Shaun Le Conte and his new fiancée Moochi Chang who have left to return to Sarnia to get married and settle into a new life in Canada. We of course wish them all the best, but out last meal together was bittersweet as we have shared at lot of ourselves with these dear people and it was a sad day for both of us to see them go. Craig Hobin and Colin Shafer have also left. Craig to return to a teaching job in Canada, Colin to pursue a Masters in London, England. Colin, pictured here, was one of the more outspoken teachers in our little corps, advocating for a panoply of freedoms that irritated the more entrenched elements in this moderately repressive country, and encouraging his students to be world citizens rather than propaganda spouting xenophobes. 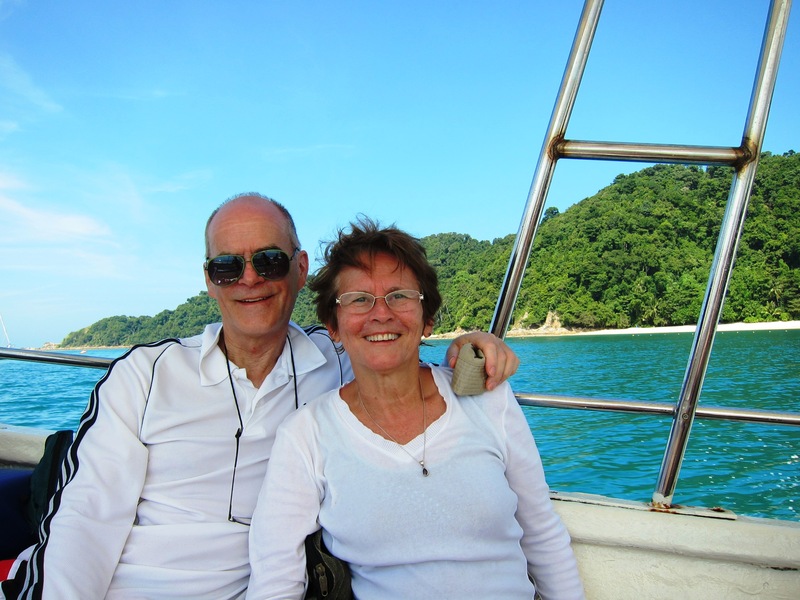 The last to go are Sid and Sharon, the closest to us in age and religious affinity. Sid is looking forward to a well deserved retirement, having been in the classroom for forty years. It is a testimony to his decency that he leaves with the commendation of all for his kindness and friendliness. We had a lovely final evening with that at Jim and Karen’s last night celebrating our friendship and their contribution to the school and the lives of teachers here. All of this leave taking has taken its toll on our spirits. At such times one tends to take stock of the friends that remain, including one’s spouse. Each of us have older friends and of course our relationship with our natal families is far older. But no relationship has been more enduring, or more important to our own well being. I am grateful for the wife a good Lord brought into my life, and my prayers go with her as she once again leaves for Cambodia this week.